Quick Time Performance Dual 2.5 Inch Electric Exhaust Cutout Kit Quick Time Performance Dual 2.5 Inch Electric Exhaust Cutout Kit, Quick Time Performance QTEC50CP Electric Cutout Kit, 2.5 Inch Electric Exhaust Cutout Kit, 2.5 Inch Exhaust Cutout Kit, Electric Exhaust Cutout Kit, Exhaust Cutout Kit, [Quick Time Performance QTEC50CP] - $456.95 : 3rd Strike Performance, Your Source for Late Model MOPAR Performance Parts and Accessories! With Quick Time electric cutouts, you can have the best of both worlds--they're quiet for the street and wide-open for the strip. These electrically controlled exhaust valves bolt to standard cutouts and can be opened and closed from inside of the car with the flip of a switch. Using the convenient interior-mounted switch, you can go from stealth-quiet to wide-open power. You control the volume and the flow. Quick Time exhaust cutouts fit any car or truck, from old-school muscle cars to high-tech imports. 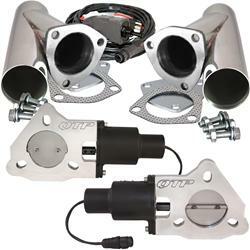 Electric Exhaust Cut Outs, Aluminum, 2.5 in. Diameter, Bolt-On, Kit. Includes two electric cutouts and two 2.5 in. polished stainless steel exhaust cutouts.